The best touring kayak is one that fits you comfortably while having features that make your weekend getaway more enjoyable. Being able to travel long distances is where the touring kayaks excel. Your cockpit should fit you snugly yet give you enough room to move your legs and abandon ship quickly if it comes to that. The best day touring kayak will have a long and sleek design that allows you to move through the water with ease and precision. These aspects create less drag in the water allowing you to conserve your energy. We have found the five best touring kayaks on the market and assembled a list to help you for your next adventure. This is the best kayak for touring that is a traditional style. It’s a sit inside type that comes in two sizes: 12 and 14 feet. The Carolina kayak is one of the most well designed touring kayaks on the market. There is loads of storage with 2 bungee systems on the bow and stern. But you also get 2 dry storage containers below deck as well. Perception Kayak has also made the Carolina with safety in mind. It has reflective cord built into the bungee system so that others can see you on the water, especially at night. Everything about this boat has been designed for long trips. The shape of the kayak especially has been thought through to the full extent. It’s taller in the front giving your feet extra room while the back is shorter creating less drag in the water. There are even knee and thigh pads so that you don’t bang your knees when entering and exiting the kayak. The Rambler is not your typical touring kayak. This is the best tandem sea kayak that is a sit on top style. This kayak is also made from highly UV and abrasion resistant material which makes it great highly durable. Since this is a sit on top style you will have much more area for your gear. It also allows this boat to be used by all experience levels. You won’t feel claustrophobic which is something most beginners complain of. 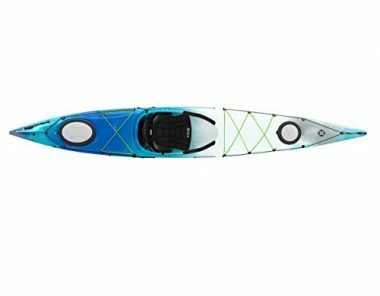 You can also use this touring kayak in many different water situations ranging from still lakes to even slow moving rivers. This gives you a versatile boat that isn’t limited to a single type of area. The seat also allows you to go on long trips. It is actually a very comfortable option for a stock seat. When this is coupled with molded in foot wells you have a kayak that you can paddle for days in comfort. This is the best sea kayak that is great for your next weekend getaway. Standing up strongly as one of the top rated touring kayak on the market, this boat is an instant winner. Skilled at maneuvering through wind and waves, the Sun Dolphin Aruba SS is great for use in the open ocean, lakes, and rivers. It provides a stable ride with its long and narrow body. It is made of an incredibly durable material which gives it a long lifespan. With a low center of gravity, you are sure to feel secure in this boat. Rough water is no match for this 12 foot kayak helping to steer you through tough times. Carrying toggles flank the kayak which make portaging this long boat even easier. An adjustable foam seat expertly cradles your back to help you sit more comfortably while the impressive design is specifically formulated to reduce pressure on your sciatic nerve. No longer fear long paddles, this spacious cockpit gives your legs enough space to move around as needed. You can pack your gear with confidence in this kayaks covered dry stern hatch. This is great for those who love to bring their camera or phone on their paddle with them. For even more storage strap your luggage on the deck with the use of the bungee system. Simply grab a dry bag to ensure that your gear will be safe. Feel good about this purchase knowing 1% of gross sales will go towards the fight against breast cancer. Keep this in mind when you buy this kayak for your next touring adventure. 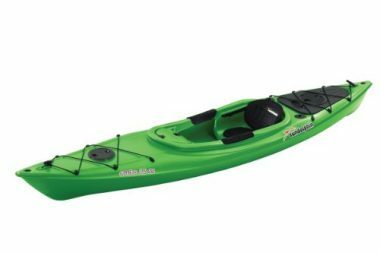 This inflatable kayak is a great option for those looking to save room when storing their new toy. The AirFusion Elite Inflatable kayak is easy to setup and use. Simply unroll it and fill it with air and you are ready to ride. Inflatable kayaks are remarkably durable due to their strong PVC construction. Often standing up better than rigid boats, inflatable kayaks will not bend or dent. The strong aluminum alloy frame ensures that this board is incredibly sturdy giving you a more stable paddle. A wide 28 inch design allows an incredibly spacious cockpit that will be beneficial in long paddles as you can bundle up with blankets if you get cold. It will also help to add more stability to the boat even in rough unpredictable conditions.This boat’s design offers lots of easy to access storage with under deck access. You have no need to be concerned with this kayaks speed. 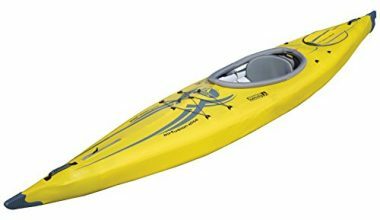 It has a high-pressure air chamber which allows it to produce a speed comparable to a rigid kayak. The easy to set up inflatable material is extremely puncture resistant giving you peace of mind on your next adventure. A custom fit seat is the first thing you will enjoy about this touring sea kayak. With comfort in mind this seat was built for long trips that will have no problem keeping you comfortable. The Riot Edge 14.5 touring kayak comes with a spacious cockpit, this is the best sea touring kayak that will give you enough room to comfortably move around while not compromising on a slender design. Coming equipped with sealed front and rear compartments you will no longer have to fear for lack of storage space. Dual density hatch covers ensure that even your most vulnerable gear will stay dry. A pilot rudder system gives you expert navigation through the water making long distance paddles even easier. Always thinking of safety this Riot kayak is equipped with reflective lines, safety straps and a security bar to ensure your day on the water stays a fun and safe experience. A drain plug makes it so that you can travel without fear into the ocean even in high and unpredictable surf. Pack a picnic on the water knowing you can safely stow your paddle on the paddle hook provided when you’re not using it. This extra long kayak expertly performs in both rough and calm waters. Paddle even longer with the incredibly comfortable custom-fit seating system which forms to your back and gives you an extra cushioned feeling to help you paddle longer. With a retractable skeg maneuvering, this kayak becomes a breeze. Three compartments and plenty of deck storage ensure you are free to bring all of your gear with you. This kayak keeps safety in mind as this boat has a dual lifeline and safety straps with a reflective finish to provide nighttime safety. A compass is recessed into the deck of this boat that will provide you with added security of always having your bearings. Pilot rudder systems and quick lock foot braces gives this boat added appeal. Touring handles are great for easy lifting while built in paddle hooks make it so that you are able to stow your paddle when not in use. This boat is an excellent buy for any long distance paddler. This is the best ocean touring kayak that you can take one step further by bringing your fishing gear along with you. With a flush mount rod holder you can go camping without packing food knowing you are free to catch your own dinner while on board this boat. An on board paddle hook is even found on deck to allow you to stow your paddle while you fish or enjoy a snack. A retractable skeg will get you where you need to go with ease while a drain plug will give you peace of mind as you brave the ocean surf. This kayak has wide and low profile hull giving it added stability. There is no shortage of storage on board with two covered storage containers as well as a bungee tie for all your additional gear. Custom fit seating and a spacious cockpit round out this impressive kayak making it an incredibly good buy for your next long distance trek. This is the best lightweight touring kayak that can fit in your bedroom closet. Sea Eagle’s Razorlite kayak inflates in under 10 minutes. The 1000D reinforced PVC has drop stitch technology which makes it incredibly rugged and durable. This truly is one of the best materials an inflatable can be made out of. Even though it’s such a rugged material it’s still incredibly easy to fold and store. Once it’s inflated you’ll forget this is an inflatable kayak. This kayak rides smooth and fast in the water. In fact, you can even reach speeds up to 6 miles per hour. This is due to its pointy nose and tail which cut through the water better than other hull shapes. Like other kayaks this one has 2 self-bailing drain valves so you will never have to worry about it filling with water. Its chair is incredibly comfortable and able to be adjusted for your comfort just like it’s foot rest. The kayak also comes with everything you need to get started including a pump, carry bag, paddle and a repair kit. Even though this is an inflatable kayak it still has quite a high carrying capacity of 500 lbs. Top rated touring kayaks are not like any other style kayak. They have features that make these excellent for longer trips through large lakes. We suggest learning about the features and options you have before getting a touring kayak and taking it on a weekend excursion. 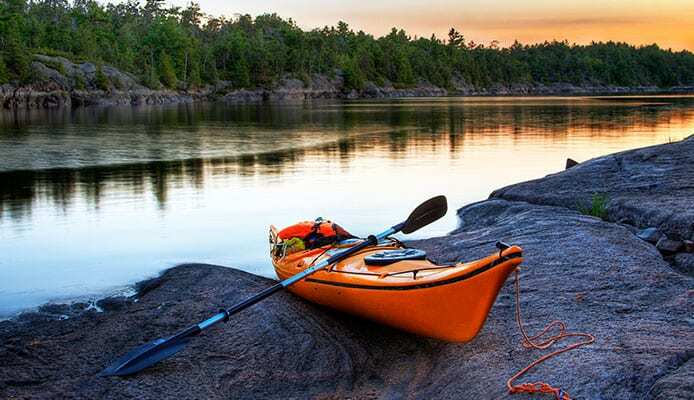 Before buying a expedition kayak it is important to know and understand the differences between the touring kayak and a sea kayak, and then to choose which one is best suited for you. While many people think they are two of the same, this is simply not the truth. 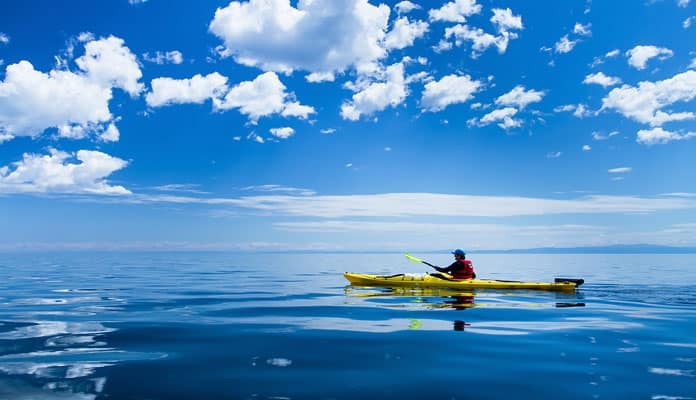 Before going any further you will need to decide whether your type of kayaking will be best suited with a more stable sea kayak or a fast and sleek sea kayak. A sea kayak is a shorter and wider boat that has a sit-on-top style. Contrasty, a touring style boat has a long and narrow design that you sit inside and is built for speed. 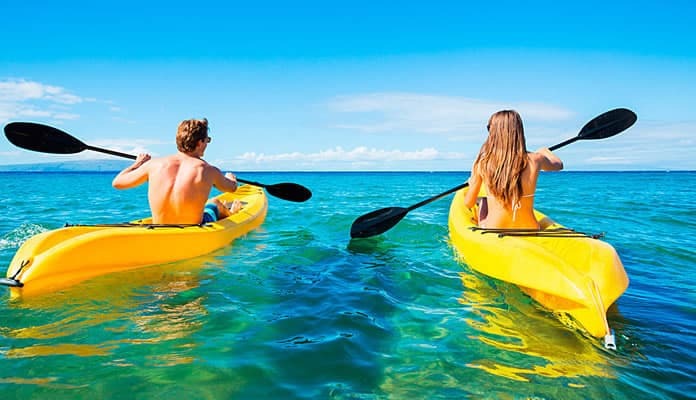 Both styles of kayaks are appropriate for use in the ocean. Deciding which one you prefer will help narrow down your options and make the process of buying your kayak much easier. No matter what you are purchasing it is always so important to consider your budget. This is especially true when purchasing a kayak as they are a fairly large investment and also have a drastic range in price. Typically you can find these kayaks for anywhere between $250 and $2,000. As you can see, this price range is quite expansive. You may be tempted to opt for a more cost affordable kayak that is closer to the $250 rage. While these kayaks can be tempting and a great option, keep in mind that with kayaks you often get what you pay for. Quite often you will find that these kayaks are not as durable, do not perform as well at sea. 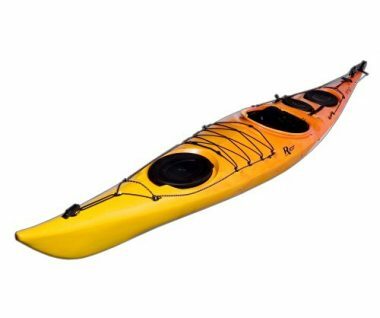 In our experience opting for a kayak closer to the $400-500 range will ensure you get a long lasting kayak with a good performance. For something that is going to be in charge of your life and floatation in the water, you will want a kayak that is of decent quality, specifically one that is durable. 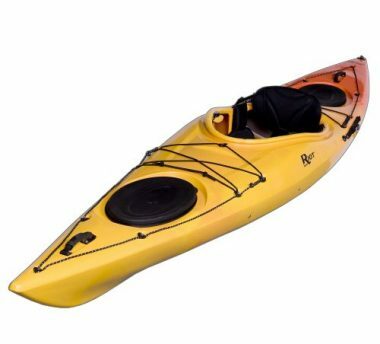 Experienced kayakers who plan to use their kayak often may want to go with a boat closer to the $750+ price point. This will allow you to get the higher quality features. For ocean kayaking, you will want a larger boat. Commonly, a bigger sea kayak comes with a bigger price tag. While this may be true, you will be getting a lot more from this extra space. Larger kayaks are more stable and can track better in the water. They are also made with a higher grade plastic that will be much more durable. The bigger kayak will come with more storage which will allow you to be better equipped for your day on the water. When creating your budget you will want to be realistic with both how much you can comfortably afford and the features you will be able to get in your price point. The best way to avoid buyer’s regret is to go with a price that you can comfortably afford. Of course, if this number is less forgiving you must be realistic with how many added features you will be able to add to your kayak. As there is quite a bit more technology and materials in touring kayaks, you can expect to pay a bit more for these boats. In contrast sea kayaks that are of the sit-on-top style are much more affordable. 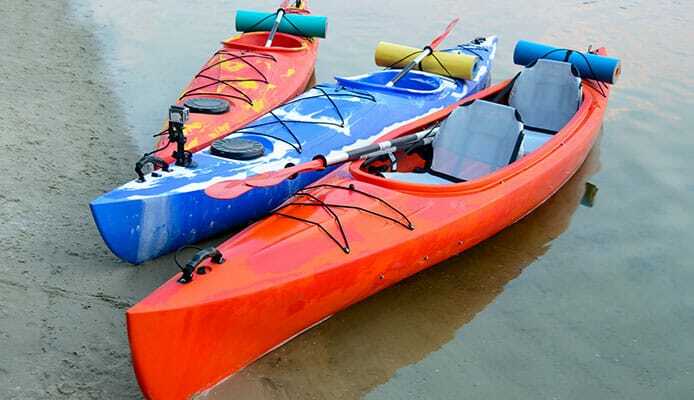 It is important to remember that you will always have the opportunity to accessorize your kayak later which can help you customize it how you like. This includes comfortable seats, dry storage, rudder systems etc. Of course, key features such as the material used and general size of your kayak cannot be changed which means you will need to place an initial focus on that. While you may be tempted to buy a kayak while shopping through the store, most often this is not where you will find the best deals. Instead, if you try the kayak out in store and then order from online you will likely find much better prices. This is ideal for those that are on a tighter budget. Touring kayaks length will vary depending on your skill level. If you are just starting out in this sport you may want to start with a shorter kayak. A kayak that is closer to the 10 foot length will ensure you can control the kayak if the weather starts to pick up. This length will ensure that you can not only power it but also take corners and move it through rough surf. For those who have some experience on the water you may be more comfortable in the 10-12 foot area. These will give you more space to spread out and storage options that you don’t have in smaller rigs. Longer options will also be more stable in rougher waters as well. Beginners can look into this option if they are on the more athletic side. It will take more strength to move this bot in the water. If you consider yourself a more advanced kayaker a longer boat will be for you. Kayaks in the 11 to 15 foot range will give you the tracking, storage and steering systems you can learn and use to your advantage. These will take the most strength and experience to move around but are also one of the more rewarding kayaks. This is the length of kayak you’ll want for extended camping trips. It is always wise to consider what you are going to be using your kayak for. Determining what types of adventures you will go on will help you to determine what kind of kayak is best for you. It is important to consider size in the beginning stages of your search. For your average day to day use you will want to navigate the right balance between size and stability. For those who tend to take shorter trips for the day or simply the afternoon opting for a lightweight and portable kayak will be best suited for you. This will allow you to quickly get your kayak ready for after work adventures. 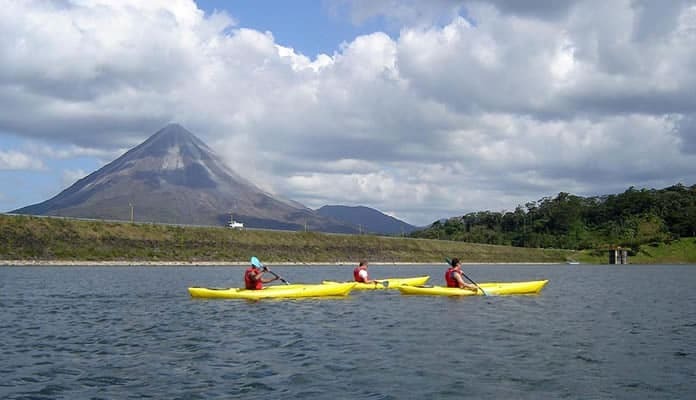 The type of kayaking you plan on doing will determine the different features your kayakshould have. If you are planning on taking multi-day trips you will want a kayak with a good amount of storage. This will allow you to pack all your gear along with you for the ride. If you are planning on using your kayak for fishing you will again need to pay attention to different features. Kayaks with better stability are far more desirable for fishing trips. You will also want a kayak with lots of surface area to add your gear. It is also desirable to have a kayak with rod ports so you will have somewhere to put your fishing gear. There are many ways you can get your kayak to the launch point. It’s worthwhile to think of this before spending the money on your kayak. If you decide on a 15 foot rig you will want to know how to get your kayak to the dock. This size kayak is great in the water but can be hard to transport and store. Keep in mind that if your kayak overhangs more than 5 feet you will need a red flag taped to the rear of the boat. This tells other drivers that you have a long load and to be aware of it. You essentially have two options for transporting your kayak: a roof rack or a kayak trailer. A roof rack will be great for most people as it doesn’t take long to setup or store the roof rack. You are only limited by the size of the kayak. We recommend sticking to under 14 feet as the roof rack only secures a small portion of the kayak. This can cause it to bend and warp especially when driving at high speeds through windy conditions. You will also need to consider the weight of your kayak. If you are needing to lift it over your head to get it onto the racking system. There are tips and tricks to do this easily, but it can still be time consuming to get it ready to go. A kayak trailer will allow you to carry any size sea kayak you want. In fact, you aren’t just limited to kayaks. You can usually carry more than one watersport rig including rigid paddle boards, canoes and kayaks. The cool thing about kayak trailers is that you don’t have to have a huge truck to tow them. Most weigh less than 200 lbs so you can tow it with any car that has a trailer hitch. With that being said, you’ll want to ensure you don’t max or exceed your car’s towing limit as it can cause engine issues or problems with your brakes. Skeg Or Rudder (Or Neither)? If you are serious about kayaking you will want a boat that has a skeg or rudder system. A rudder will be found at the most rear part of the kayak. Kayaks that have this system will have a control setup that is controlled by your feet. This keeps your hands on the paddle at all times. Simply moving one foot at a time will steer the kayak while your paddles will keep you moving in a forward direction. You may ask yourself why is this necessary? I can simply paddle on one side more than the other to steer. That’s true, but this can get difficult when you’re stuck in a current or large swells. Currents can push your boat around and cause you to work exceptionally hard to be pointed in a straight line. Turning can also be an issue without a rudder. With one you simply move your feet to steer. Without one you have to think about over paddling one side and under paddling the other. A skeg similar to a rudder in that it will help you maintain your heading but different in that you won’t be able to use it to turn. This system will be able to be retracted for when you enter shallow water as well. Being able to retract it will give you the ability to be selective with when you use it. That’s right, you won’t always have it in use when paddling. If you find the weather starting to change you can lower it giving you more control over the conditions. This is a great way to increase your confidence when on the water. While you will likely be looking to buy your kayak online as they are far more cost effective it is wise to still try out your kayak. Going to your local outdoor store to try out the kayak before purchasing is a good idea as it will give you a better idea of the sizing. Of course, this can also be done by reading the sea kayak reviews and getting the dimensions from the online store. Not all cockpits have the same size. If you are a considerably smaller or larger person than average, you may find less comfort in specific kayaks. This is especially true as some kayaks that are designed for touring are quite a bit thinner in design. This gives you considerably less room to sit inside. For those looking for a more spacious design, you may be better suited with a sea sit-on-top style kayak. This allows you to move around with ease giving you considerably more room. Additionally, you will want to pay attention to the seat of your kayak. Sit on top style kayaks often have a molded seat area that provides no back support. This is unideal for many paddlers who require the extra cushioning. Sit in kayaks typically feature adjustable seats that make it ideal for longer paddles. Of course, this is something that you are able to upgrade later. Installing a replacement kayak seat is quick and easy. You will also want to ensure that the kayak that you choose has adjustable foot rests. You will be far more comfortable with footrests that actually fit your leg size. Oftentimes, molded foot rests or adjustable rests will be what you find. These will make your time on the water much more comfortable. Accessorizing your boat is a great way to increase your comfort on your kayak. Adding an umbrella to the back of your kayak will provide you with a welcomed shelter from the hot sun. This will allow you to sit out on the water for longer without fear of getting burnt. A GPS is another device that will make your time out on the water a lot safer and more enjoyable. With this you can paddle further without fear of getting lost. This is bound to put your mind at ease. A sea kayak is one used for long distance trips. 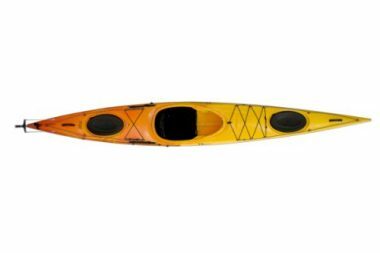 Great for overnight trips or distance training, these kayaks are typically long and slender in shape. Touring kayaks are often brought into the ocean to brave the surf and expertly maneuver through choppy water. There are many features that make a sea kayak different from any other type. Touring kayak reviews agree that comfortable seating, as well as lots of storage space, should be at the top of your list when looking for your new kayak. Touring kayaks carry a long narrow design which allows them to cut through the water with little resistance. Their pointy nose allows them to do this while a smooth texture creates little drag. It is also important for their design to be sleek in an effort to help you glide over still water without much force from your paddle strike. The shape of the hull ensures that they have a good initial stability and an even better secondary stability. In plain English, this means that sitting in the water a touring kayak won’t be the most stable, but once it gets up to speed the stability increases. As avid kayakers know, this helps with steering your rig. Being able to pack anything and everything you need for a whole weekend takes space – something these kayaks have. Touring kayaks have large storage containers under their deck, utilizing their long noses and tails. These compartments along with additional bungee systems will ensure you are prepared for your travel ahead of you. A comfortable seat is vastly important especially since you will be sitting for a long time. These are meant for long trips and that is why they have custom designed seats with lots of cushioning. We suggest sitting in the kayak before purchasing it to see if you are comfortable and that your legs can fully extend with ease. A good seat will be adjustable and have padding making your trip more enjoyable. You want a kayak that fits your body size. If you are a smaller person this could mean filling the space around you with blankets to make it more snug – also keeping you warm on those chilly morning paddles. Less space around you means you will have more control. This is important especially when the weather changes and the water gets choppy. Being able to steer and maneuver with ease will not only get you home but make the journey that much more enjoyable. The material varies for different types of kayaks. 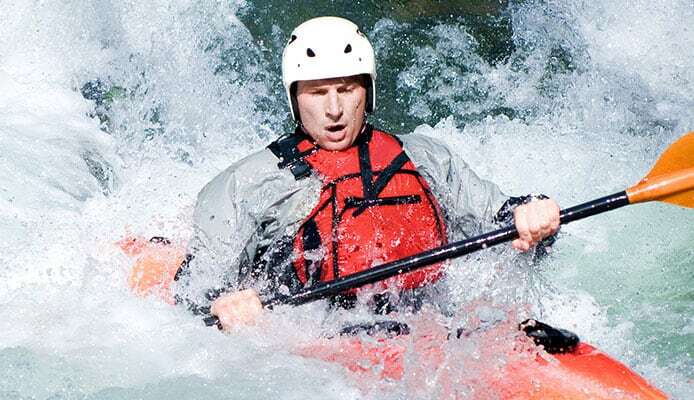 Polyethylene is one of the most used materials for kayaks. It is durable while being flexible and affordable. It is prone to warping and damage if these kayaks are stored in the elements. Polycarbonate plastics are the next best. They have a glossy finish while being more scratch resistant than a polyethylene boat. They are also easier to repair while still being affordable. Fiberglass is another lightweight material that is easy to repair. It is not as durable in regards to scratches and dings, but the repairability makes up for it. Kevlar is one of the best materials but comes at a price. It is a hard material to repair but is as strong as steel. Kevlar will not be affected by dragging it on rocks or sand like the other material and is flexible. Q: What Is The Difference Between A Touring Kayak And A Sea Kayak? A: A sea kayak and touring kayak are quite similar in a lot of ways. For a long time they were grouped into one single category of kayaks. But as the sport became more popular companies started distinguishing differences between them. A sea kayak, like the name implies, has been designed for use on the sea. This means it has a spray skirt to keep your bottom half dry in high surf and spray. It will also have more secondary stability so you don’t tip over. This refers to how the kayak tips in the water. Secondary stability will allow the touring kayak to tip more than a regular one but not flip over. This extra stability is due to the sit on top style where you can stretch your legs and use them for added stability. At one point both of these types were grouped into the touring kayaks category. Touring kayaks are known for their long skinny bodies with lots of storage and great stability. They also usually have rudder systems that keep them pointed where you want them to go. The main difference is that touring kayaks are meant for more calm water. They won’t be able to handle the large swells that sea kayaks will. Q: How Big Should My Touring Kayak Be For Women? A: Touring kayaks will usually range in length from 11 to 15 feet. Women should look for a kayak in the 11 to 13 feet range. This will give them a long kayak that has loads of storage but is easier to control than the longer versions. Q: What Size Kayak Paddle Should You Get For A Touring Kayak? A: You will want a smaller kayak paddle for a sea kayak. Since you are going to be travelling long distances you will need a small lightweight paddle. This will not strain your body and allow you to paddle for hours if you need to. A touring kayak paddle may cost a little bit extra but it will be worth it after a couple hundred strokes. If you have, say a recreational paddle, you will find your body will get sore much more quickly. Make sure your paddle is also lightweight. If you can’t justify spending extra money on a paddle with high end materials you should at least find a lightweight one. When you’re doing this you will want to make sure you don’t sacrifice the diameter of the shaft. This can make the paddle weak and even bend under heavy use. Q: How To Put Touring Kayak In A Full-Size Truck? A: Touring kayaks can have a length of up to 15 or 16 feet. Truck beds are usually around 6 feet long. This means your kayak will have up to a 10 foot overhang, something not ideal when transporting. You can close the tailgate and have the kayak sit angled from the roof of the truck into the bed, but then you’ll have the kayak stick well above the cab of the truck – again, not ideal. There are roof racks specifically designed for trucks that will extend the roofline of the cab. This will make your kayak sit above the cab and box of your truck reducing the amount of overhang you have. This is a more ideal situation when transporting your touring kayak. If you have a place to store one, a kayak trailer will also be a great option for you. This will free up the entire bed of the truck allowing you to pack camping gear so you can set up for an entire weekend. Q: Average Miles Per Hour When Kayak Touring? A: This will vary widely depending on the person paddling. If you are fast paddler you will obviously go quicker than someone taking their time. The average paddler will travel around 3-4 miles per hour if they are just out for a paddle without a destination in mind. If you are racing you can get up to 7-9 mph. Just keep in mind that there are many variables that will affect your speed. Everything from the weather to the type of kayak and even how much gear you’re bringing along. If you are curious about your speed GPS units and some fish finders will be able to track your speed. You can set them up so you can get a better understanding of your speed while you paddle. Q: How To Balance A Touring Kayak? A: Most people don’t think about balancing their kayak when, in fact, this is a crucial part of setting up your kayak. Nearly every option will have at least 2 places to store your gear. This can include a bungee system or a dry hatch which stores stuff inside the hull of the kayak. If you load all of the heavy gear on one side you will spend energy trying to lean the opposite way. This will also cause your kayak to turn and be more prone to tip over. Before you even get into your sea kayak you should plan how your gear sits. If you are using a waterproof backpack that you strap to the bungee system you will want to organize the contents accordingly. No matter which way you place it you will want it to have equal weight on either side. When you pack a dry hatch you will also want to ensure that the weight is evenly dispersed. This may be harder to do since companies usually use a bag that hangs in the hull. Q: What Are Rudders For On A Touring Kayak? A: If you have ever used a paddleboard without a fin you will know the importance of a rudder on a touring kayak. Instead of going in a straight line like you’d expect, your board will simply slide around on the surface of the water. This will be the same for your kayak. A rudder system will ensure you stay pointed in a straight line. It will also help in rough or choppy water as well. Kayaking is a favorite sport of so many. Whether you go with a group or prefer solo paddling, a day kayaking on the lake is always a day well spent. This is a great full body workout making it easy to get in shape. A touring kayak is designed for long distance paddles that can span a whole weekend. Take one of these boats and explore the shore or paddle to the island you’ve always wanted to see. Use your kayak for long distance paddles? Have one on our list? Let us know how you like it in the comment section below.